I especially enjoy observations that point out something so obvious that we don’t usually notice. Call it the “fish don’t notice the water” phenomenon. This article points out that pharmaceutical companies only research those drugs that have a realistic potential to earn the company significant profits. 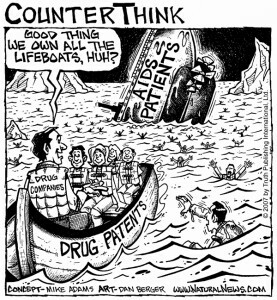 The fact is that the primary business of pharma corps is to earn profits, not to make effective drugs. Now that we have eliminated much of the public funding of research and turned it over to private commercial interests, this plain fact has very important consequences. Should randomised trials be the only type of evidence accepted for rolling out drug treatments? The evidence we have might not be the evidence we need, and the evidence that we need may never become available. They are writing in response to the publication of a trial of a new combination drug treatment for stomach cancer that seems to extend people’s lives by nearly 3 months.